Screaming newspaper headlines  in Europe, Turkey and the United States suggest that Turkish-European relations are on an irreversible downward slide. They imply that not only has Turkey lost interest in its prospective membership of the EU but also that many, if not most, Europeans have come to see the Turkey–EU relationship as a zero-sum game portraying the impending clash of civilizations between Islam and the West foretold by Samuel Huntington  a quarter century ago. Reality is, however, far more complex than the headlines suggest. No doubt there are genuine differences that have often impeded the development of Turkey’s relations with the EU. However, the recent escalation in tensions has more to do with the domestic political agendas of important actors both in Turkey and in key European countries, such as France and the Netherlands, than with bilateral relations between Turkey and the EU. Domestic developments in Turkey and in important European countries feed off each other. Currently, Turkish domestic politics revolves around President Erdogan’s attempt to change the country’s constitution from the present parliamentary form to one that concentrates power in an executive president but without most of the mechanisms that act as effective checks on the executive’s power (as in the United States). The ostensible reason advanced by the supporters of constitutional change is that it would make for unified and speedy decision-making that’s essential for Turkey stuck in the quagmire of the Syrian civil conflict on the one hand and a revitalized secessionist challenge from part of its Kurdish population on the other. The real reason, however, is Erdogan’s ambition to be an all-powerful president for the next decade, if not longer. Erdogan’s Justice and Development Party (AKP) was able to garner the required number of votes  in the Turkish Parliament with the help of the ultra-nationalist MHP to bring the new constitutional draft to a popular referendum to be held on 16 April. However, the constitutional amendment has faced strong resistance from the main opposition party, the CHP, and the predominantly Kurdish HDP both with substantial support in the country. Additionally, Turkey has witnessed increasing dissatisfaction with Erdogan’s dictatorial behavior, which has been very much on display  since the abortive coup of last July. Those factors make it far from certain that the constitutional amendment will be approved in a referendum. That’s made Erdogan and his government nervous to the point of hysteria. Europe has become a convenient whipping boy for Erdogan and his ministers in this context for several reasons. First, the EU and major European countries, such as Germany, have been harshly critical of the unabashed display of Erdogan’s autocratic tendencies, thus annoying the Turkish leader. Second, Erdogan’s high-handed actions have indefinitely postponed prospects Turkish membership of EU thus significantly reducing its importance in Turkish foreign policy priorities. Third, Erdogan finds Europe a convenient target against which he can direct Turkish nationalism  in order to boost his popularity. Islamophobia in Europe, especially in the context of elections in the Netherlands and France, and later in the year in Germany, has also added to tensions between the EU and Turkey. The dramatic intensification of anti-immigrant sentiments, particularly aimed at Muslim immigrants, including refugees, from the Middle East and North Africa, is one manifestation of that trend. Islamophobia has significantly contributed to the dramatic rise in popularity of right wing parties and leaders, such as Geert Wilders in the Netherlands and Marine Le Pen in France. Both these leaders have called for their countries to leave the EU as it’s seen as being “soft” on Muslims . Geert Wilders’ Freedom Party didn’t do as well in the 15 March elections as projected  and is unlikely to be a part of the ruling coalition. However, his party has emerged as the second largest party in parliament. That, combined with his promise to de-Islamise the Netherlands, has radically changed the political discourse in the Netherlands. It’s likely to further strain Netherlands’ relations with Turkey. 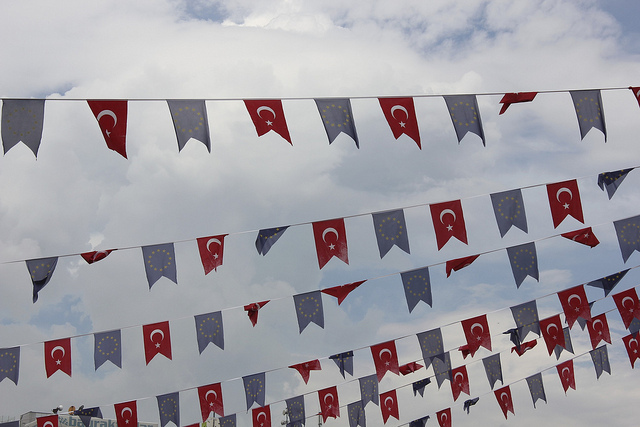 If France follows suit with impressive right-wing showings in the presidential and parliamentary elections slated for April and June respectively, Turkey’s relations with Europe are likely to suffer even more at least in the short term. However, once this cycle of referendum and elections is over, things are likely to return to business as usual, as both Europe and Turkey have several major security and economic interests in common. EU is Turkey’s leading trade partner and Turkey is an indispensable member of NATO protecting the latter’s eastern and southern flanks. So while the exigencies of domestic politics on both sides may temporarily impact negatively on Turkish–European relations, their long-term effects are likely to be moderated by geo-political and geo-economic factors that have in the past helped to keep these relations relatively stable. Mohammed Ayoob is University Distinguished Professor Emeritus of International Relations, Michigan State University, and Senior Fellow, Center for Global Policy; author most recently of Will the Middle East Implode? Image courtesy of Flickr user David.